At the Car Park Committee on 26th April 2019 the Councillors agreed that the new car park will be called the Long Street Car Park. This new car park will be free to use and is considered a long stay facility with a maximum waiting time of 23 hours in a 24-hour period. This is a similar restriction to the other long stay car park in the town. At the Council meeting on Tuesday 2nd April 209 the Council confirmed the recommendation of the Car Park Committee that traffic management of the car park including enforcement of the maximum waiting restriction will be carried out by District Enforcement Ltd on a 12-month contract. The enforcement will be controlled by an automatic number plate recognition (ANPR) camera which will record all vehicle movements into and out of the car park. Any registered owner of a vehicle overstaying the 23-hour limit will receive a fixed penalty notice. A review of the parking statistics will be carried out by Councillors during this period. The new long stay car park is nearing completion with the surfacing and white lining having been carried out in March by our contractor, Alun Griffiths (Contractors) Ltd. Although it looks finished, there remains work to be done before it can be fully accessed by the public. The lighting, CCTV and landscaping works remain to be completed, therefore we estimate the car park will be open to all users by the end of May 2019. We are liaising with Gloucestershire County Council to agree signage in the town centre for the new facility and improvements to the entrance of the car park on Long Street. 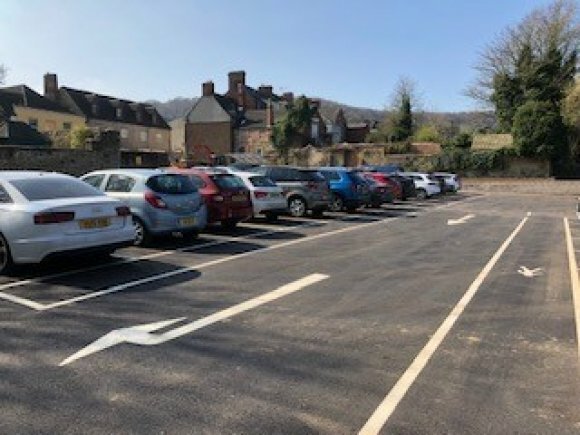 Cllr Symon Ackroyd, Chair of the Car Park Committee said "although it is taking longer than we originally anticipated, I am pleased at how the scheme is progressing. It was good to see the car park fully used by attendees of a Heart of England event in the Chantry Centre on the 28th March which we used as a trial. My thanks to the Dursley Lions who acted as marshals". Planning Conditions for Proposed Car Park at Reliance House, Long Street, Dursley. Who should benefit most from a new Long Stay Car Park? Should the Town Council introduce parking charges? HTML5 validated. WCAG compliant. Page generated in 0.087 seconds.